One less car, one more bald sheep. Where the rubber -- er, yarn, -- meets the road. How good is Derrick? He's such a good mechanic, he gave this bike a tune-up. Envious of Rocky River's winter building projects, Medina decided to get crafty. Um, Grandma? For Christmas I said I wanted a "kite kit," not a "bike knit." I know it's been a little slow at the stores, but this is ridiculous. You should see the scarf! Jag har inte slutfört något av allt det jag började på förra veckan. den är för övrigt inte stickad utan virkad! "Define your life. 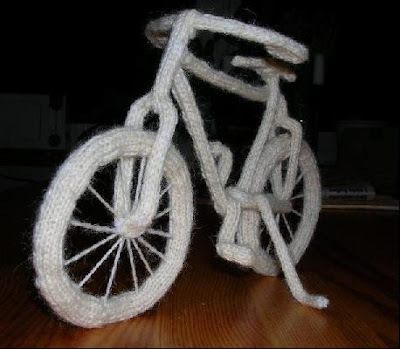 Knit a bike!"